I was going to incorporate the poems on the actual window lamp structure, but yesterday I decided to have them as separate entities which are, nevertheless, still related to Diva. 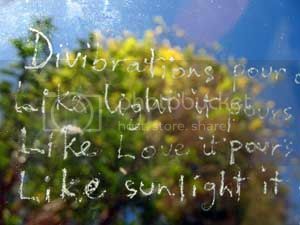 Tracy J's poem is etched into glass, in honour of Diva's panes. In the above photo the glass with the poem engraved on it is held up against the yellow poui on the hill in the garden. 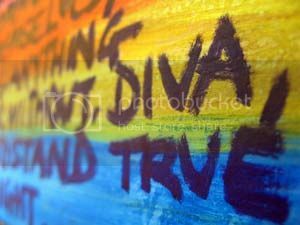 Guanaguanare's poem is painted onto wood (a wooden art board) in honour of Diva's wooden frame. These two poetic elements will be presented along with Diva when she is finally given to her new owner(s). They can choose to keep the poems for themselves or give each one as a gift to selected individuals. This will be similar to what happened to the other poems. We will hear more about their fate within the next few days. Meanwhile, Diva continues toward the point of completion. I painted the back of her frame in white yesterday. Now all I have to do is put on her electrical cord and bulb ... and she will be ready for the world!